October 30, at 5 Kensington terrace, Rathmines, Mary, the beloved wife of D.T. Tracey, Esq. Requiescat in pace. ... D. Y. Tracey, Esq., of Rathmine, Dublin, to Adeline Mari Anne, second daughter of Charles Morine, Esq., of this city [York]. November 26, in the Catholic Chapel, Blake-street, York, D.T. Tracey, Esq. of Rathmines, County Dublin, to Adeline Marianne, second daughter of Charles Morine, Esq, of York. .. Charles H Tracey, aged 31 years. RIP. Funeral will leave 30 Carysfort avenue, Blackrock, to-morrow, Tuesday, morning at 9.30 for Glasnevin cemetery. ... D. T. Tracy, Esq., 25, Castlewoodavenue, Rathmines, of a son. ... D. T. Tracey, Esq, C, Carlisle-terrace, Malahide, of a son. D. T. Tracey, Esq., and second daughter of the late Charles Morine, Hear., of this town. ... Daniel Tracey, 57 Caryfort ave, Blackrock, county Dublin. Very Rev. William Tracey was born at Marymount, parish of Camross, and received at least part of his education in France, where he narrowly escaped the guillotine at the time of the Revolution. He was ordained by Dr. Lanigan about 1796, after which he was C.C. Rathdowney till 1799. His next Curacy was Muckalee, whence he was promoted to the pastorship of Rathdowney in 1802. He became Treasurer of the Diocesan Chapter in 1837. Having governed this parish 37 years, he died at his house in Barrachill, Oct. 7th, 1839 at the age of 68, and is buried in Grogan chapel. Two of his nephews were respected priests of Kildare and Leighlin Diocese, viz., Rev. William Tracey, P.P. Kilcock, and Rev. Felix Tracey, P.P. Ballyna. Kilcock: The present very fine parochial Church was commenced in 1862, by the late Rev. Willian Treacy, P.P., who had expended £1,000 on the work, when he was called to his reward. He left, partly of his own means, and partly the result of subscriptions received, £3,000 towards its completion, to effect which cost some £6,000 more. It is in the early Gothic style, from a design by MacCarthy, and consists of chancel, nave, and aisles, with a massive tower 108 feet in height; including the tower, which is at the west end, the church is 131 feet in length, and is 60 feet in width. It was dedicated to the service of God, under the invocation of St. Coca, in 1867. Over the grave of the founder, within the church, a monumental brass bears the following inscription: "Sacred to the revered memory of Rev. William Treacy, who had been 24 years P.P. of Kilcock; the founder of this church,- who departed this life on the 25th May, 1862, in the 59th year of his age. This monument was erected by his affectionate brother, Rev. Felix Treacy, P.P. Balyna." The beautiful and costly High Altar, and a fine stained-glass window over it, are also memorials of Father Treacy, erected by the parishioners. Ballyscullogue: The fine Gothic chapel-of-ease at Newtown, is situated in the parish of Sculloguestown. It was erected by the Rev.William Tracey, P.P., at a cost of £3.000. A slab placed over the front door of Newtown church bears the following inscription: -"Pray for Rev. William Treacy, who faithfully served God in this Parish during 32 years; - 8 years as Curate, 24 as Parish Priest. To whose ready and unsparing liberality, and still more unsparing exertions the Parish is mainly indebted for the erection of this Church. May the Lord have mercy on his soul. Amen. Obsequies of the Very Rev. Felix Treacy, P.P.—In the quiet little cemetery attached to the community house of the Oblates of Mary Immaculate, Inchicore, was laid at rest, on Friday of last week, all that was mortal of the venerable priest Father Felix Treacy, who passed away to his eternal reward at the patriarchal age of 92 years. Sixty-six years ago he received ordination at Maynooth, and during that long period of time he was ever a zealous and model labourer in the vineyard of his Divine Master' ever watchful over the interests of religion, attending with faithful assiduity to the wants of his flock, and reflecting in his character every priestly virtue. With that wisdom and prudence which always distinguished him he retired some twelve years since from the active ministry, feeling that his advancing years prevented him from bestowing that care which his sacred office required, and this step he took, as he so often told his friends, that he might have time to spend in preparation for a happy death. Dublin...Prepared by a life of prayer, by the practice of Christian virtue, and fortified by the rites and consolations of the church, the Very Rev. Felix Treacy, P.P., the patriarch among the Irish clergy, on Feb. 15 passed from this life to the enjoyment of the reward promised to the good and faithful servant. Father Treacy had just completed his ninety-second year. He received ordination in Maynooth in 1830, and immediately entered upon his priestly duties in the diocese of Kildare. In due time he was appointed parish priest of Ballyna. Two beautiful churches and several schools are abiding monuments of his zeal and, piety. At the age of 80 he withdrew, from pastoral cares and responsibilities, was received as a guest by the oblates at Inchicore, and devoted his last years to his own personal sanctification. He had a peaceful, holy death. The Patriarch of the Irish Clergy. - Prepared by a life of prayer, by the practice of Christian virtue, and fortified by the rites and consolations of the Church, Rev Felix Treacy, the patriarch of the Irish clergy, passed to the enjoyment of the reward promised to the good and faithful servant. He had just completed his ninety-second year. He received ordination in Maynooth in 1830, immediately entering upon his priestly duties in Kildare. In due time he was appointed parish priest of Balyna. Two beautiful churches and several schools are monuments of his zeal and piety. At the age of eighty he withdrew from pastoral cares and responsibilities, was received as a guest by the Oblates at Inchicore, and devoted years to his personal sanctification. He has had a peaceful holy death. PRAY FOR THE SOUL OF THE REV. FELIX TREACY, PARISH PRIEST OF BALYNA FOR 31 YEARS. WHO DIED 5TH FEB 1896 AGED 92 YEARS. BORN AT MOUNTRATH. IN 1804 HE MADE HIS STUDIES AT MAYNOOTH WITH DISTINGUISHED SUCCESS AND WAS ORDAINED BY DR. DOYLE IN 1830. APPOINTED TO THE PARISH OF BALYNA IN 1855, HE LABOURED FOR HIS FLOCK WITH EARNEST ZEAL AND BUILT THE TWO GOTHIC CHURCHES OF BROADFORD AND CLOGHERINKOE WHICH WERE COMPLETED IN 1868. RESIGNING HIS PARISH IN HIS 82ND YEAR. HE SPENT THE REMAINDER OF HIS LIFE PREPARING FOR DEATH AT THE HOUSE OF THE OBLATE FATHERS, INCHICORE. THERE HE DIED FULL OF YEARS AND SANCTITY AND THERE HE IS LAID TO REST BUT THIS MONUMENT IS PLACED IN THE CHURCH WHICH HE HAD THE HAPPINESS TO BUILD FOR HIS FLOCK, THAT THE FAITHFUL MAY BE REMINDED TO PRAY FOR THE REPOSE OF HIS SOUL. R.I.P. Tracey, Daniel, Junr., s. of John, Tenikilly, Queen’s Co. (Laois); under 20; aft. Daniel, solicitor, uncle. H 1864. Daniel J Treacy (s. of Joannis & Mariae Treacy of Tinikilly Queens Co) of Lurgan m. Maria J Keon (d. of Ferdinandi & Mariae Keon, mortai) of 8 M Gardiner Pce on 27 February 1878 Wit: Joannes Treacy of Tinikilly & Anna Treacy of Tinikilly. Pro-Cathedral Dublin. Treacy and Keon - February 27, at the pro-Cathedral, Marlborough-street, by the Rev TJ O'Reilly, CC, Daniel Joseph Treacy, Esq, JP, Teinkilly, Queen's County, to Mary Josephine, only daughter of the late Ferdinand P Keon, Esq, New Brooke, county Leitrim. ... D. J. Treacy, solicitor, of a son. Treacy - July 20, at 102 Lower Mount-street, the wife of D.J. 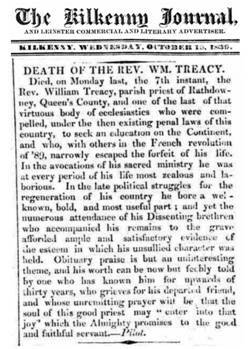 Treacy, solicitor, of a son. Treacy - December 15, 1925, at his residence, 12? Upper Leeson street, Daniel Joseph Treacy, ??? son of the late John Treacy, J.P. Teni??? Mounthrath. RIP. Funeral private. No ???. Treacy - January 8, 1927, at her residence 18 Upper Leeson street, Dublin, Mary Josephine, widow of the late Daniel J. Treacy, Solicitor, Mountrath, and grand-daughter of the 2nd ??? de Blaquiere?, Port Letunn? Mullingar R.I.P. Mary Josephine Treacy of 18 Upper Leeson Street Dublin widow died 8 January 1927 Probate Belfast 22 July to Frederick De Vere White solicitor. Effects £2520 6s. 8d. John Joseph Treacy, only son of D. J. Treacy, Belle Vue, Mountrath, solicitor. Certificate signed by Daniel Kehoe. Proposed by T.L. O'Shaughnessy K.C. Daniel J. Treacy, Solicitor, Mountrath. Last night on the net I picked up a reference to Mary Josephine Tracey`s death , "01/08/1927 at her residence 18 Upper Leeson St , Dublin , widow of the late Daniel J Tracey , Solicitor , Mountrath and granddaughter of the 2nd ??? should be (Lord) de Blaquiere of Port Letunn , should be (Portloman) Mullingar . RIP ". I am at present looking at the Family History of the Irish , Blaquieres` and de Blaquieres`and of course very interested in the above . I have a fair working knowledge of the 2nd Lord John deB and his son`s and daughter`s . I would be very interested to know which son or daughter Mary Josephine is descended from and her maiden name , to help with my records . I do hope you can help me with this information or put me in touch with some one who can . I am only too happy to pass to you a copy of all my records on the 2nd Lord if by chance you , or any one else is interested . Best wishes and hope you can help . J A (Tony) de Blaquiere . ...Under-Sheriff of the County and City of Dublin, for the repayment of two guineas...he paid Mr. Daniel Tracy [late sub-sheriff] out of his own pocket, three guineas for summoning a jury...Mr. Henry, solicitor, said he appeared for Mr. Tracy having acted for him as returning officer in 1859. City of Dublin. Johnston Holland, owner, William Carroll, petitioner. The dwelling house and premises No. 4 Lower Pembroke street, held for 77 years from 1857; profit rent £28/0/8. Sold to Mr. D. Tracy, in trust, for £470. In the matter of the estate of Johnston Holland, owner; William Carvill, petitioner. Dwellinghouse and premises, No.4 Lower Pembroke street, held for a term of 77 years, from the 29th day of september 1857, subject to the yearly rent of £20 sterling; profit rent £28. Mr. D. Tracy was the purchaser, in trust, at £470. ...Mr. Patrick Falkner, grocer, Henry-street...brother's death two years ago...I paid a rent of £60 a year to Mr. Tracy, of the firm of Kernan and Tracy...Mr. F. Kernan...purchased in May 1850 at a sheriff's sale. ...apply to Messrs. Kernan and Treacy, Solicitors, 13 Cork-hill, Dublin. July 15th, 1865. List of electors, City of Dublin. In the matter of Daniel Thomas Tracey of Auburn Villa, Rathgar in the county of Dublin, surviving partner of Thomas Doran and Daniel Thomas Tracey, trading as flax spinners as the Salmon Leap Mills (Leixlip) in the County of Dublin under the name, style and firm of Thomas Doran and Company...Kernan and Treacy, agents to the Bankruptcy, No.13 Cork-hill, Dublin. In the matter of Daniel Thomas Tracey of Anburnvilla?, Rathgar, in the county of Dublin, surviving partner in the firm of Thomas Doranand Daniel Thomas Tracey, trading as Flax Spinners at the Salmon Leap Mills, Leixlip, in the county of Dublin, under the name, style and firm of Thomas Doran and Company, a bankrupt. In re Daniel Thomas Tracey. The bankrupt who was the partner of Thomas Doran, deceased, in the Salmon Leap Flax Spinning Mills Comapny, county of Dublin...Mr Kernan QC, instructed by Messrs Kernan and Tracy, was councel for the bankrupt. David Thomas Tracy, partner of Thomas Doran, deceased, in the Salmon Leap Flax Spinning mills, county of Dublin. Messrs. Kernan and Tracy appeared for the bankrupt. Mr. Larkin said that the bankrupt was at present a clerk at a salary of £290 a year and he asked to have a portion of his salary allocated for the benefit of the creditors. Daniel Thomas Tracy, of Anbura? ville, Rathgar, in the county of Dublin, surviving partner in the firm of Thomas Doran and Daniel Thomas Tracy trading as flax spinners, at Salmon Leap Mills, under the firm of Thomas Doran and Company. In re D.T. Tracey...machinery...passed to assignees. The Clerk of the Peace for Dublin, Mr. Charles Kernan, attorney, [applied for banruptcy]...The bankrupt not having filed acts of partnership with Mr. Tracey, an adjournment was ordered until November. Petitions Filed Against. Nov. 30. Daniel Tracy, late of No. 12 Cork-hill, in the city of Dublin, gentleman, attorney. In re Daniel Treacy - The bankrupt was a solicitor and had been a member of the well-known firm of Kernan and Treacy. Liabilities to the extent of over £40,000 were returned upon schedule, £10,000 being to the Hibernian Bank, of which the bankrupt was one of the solicitors. The petition was filed by a creditor so far far back as September 1871, but the schedule was not furnished until the present year...Superioress and community of St Brigid's Convent, Mountrath [£1800 entrusted to him]...Mr. Treacy stated that the Rev. Felix Treacy had acted very generously toward the firm of Kernan and Treacy, and had advance in the last year or so of the partnership no less than £3,600 for which he had obtained mortgages of property scarcely equal to his advances...the assingess felt that they could not press for further punishment than the bankrupt had already volunteerily subjected himself to, he having been in custody since the 3rd May 1870, and having now made a full disclosure of his estate and effects...The order of discharge was then made out, and the bankrupt was liberated. In the matter of the estate of Daniel Treacy owner and Eliza Mary Byrne petitioner. In the matter of the estate of Daniel Treacy trustee and executer of Patrick Murray deceased owner and Ellen Moore Spinster petitioner. In the matter of the estate of Daniel Treacy owner expartate and Guinness Mahon & Co petitioner. The dwelling house of No.4 Lower Pembroke street held for a residue of a term of 77 years from the 29th September 1857, subject to the yearly rent of £20 and producing a profit rent of about £52/10/0. Sold to Mr. R. Guinness for £430. In the matter of the estate of Daniel Treacy owner and John Hobbs Peart petitioner. The ballot having been examined, the following gentlemen were elected as Members of the Society…Daniel Thomas Tracey. Twenty-Seventh Session.—Fourth Meeting. [Tuesday, 21st April, 1874.] The Society met at the Leinster Lecture Hall, 35, Molesworth street... The ballot having been examined, the following gentlemen were elected as Members of the Society :—...Daniel Thomas Tracey. The examination of the voluminous returns received from the clerks of the several unions, the checking the area and valuation in each, and the subsequent re-arrangement and consolidation of the union returns into county returns, as well as the general arrangement and summarizing of them, and carrying them through the press, has devolved up the statistical department of this office, the principal of which, Mr Daniel Thomas Tracey, has discharged the heavy additional duty thus thrown upon him with much zeal and intelligence and in a manner which, in the opinion of the Board, merits the highest commendation. We believe there is no doubt that Mr. Treacy, of the firm of Kernan and Treacy, has been appointed Clerk of the Crown for the King's County, in the room of the late Mr. Pemberton. From the character of Mr. Treacy, and the high standing in the profession of the firm to which he belongs, the appointment cannot fail of giving general satisfaction. We believe there is no doubt that Mr. Treacy, of the firm of Kiernan and Treacy, has been appointed Clerk of the Crown for King’s County, in the room of the late Mr. Pemberton. From the character of Mr. Treacy, and the high standing in the profession of the firm to which he belongs, this appointment cannot fail of giving general satisfaction. The Lord Lieutenant has sanctioned the transfer of Daniel Treacy, Esq, for the Clerkship of the Crown for the King's County to that held by the late George Pilkington, Esq, for the Queen's County. His Excellency has conferred the appointment rendered vacant by Mr. Treacy's transfer on Joseph Lyons, Esq, of Maryborough. The name...of Mr Daniel Thomas Tracy, Rathgar, was omitted in our list of those who attended the Cardinal's reception.